This intensive course in the applied arts field of jewellery at the Ruth Prowse School of Art develops both the professional manufacturing and designing of simple to complex jewellery. The jewellery produced remains both individualised as well as having an indigenous character. The outcome of the program is for the students to acquire extensive knowledge and skills which would enable them to enter the jewellery industry with portfolios that show excellent practical, theoretical and design skills. 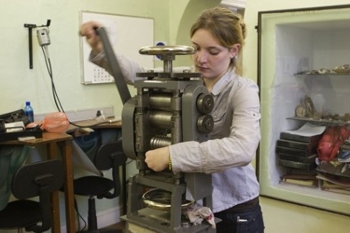 The School integrates practice and theory, as well as techniques and principles which are thoroughly explored with a view to creating both unique pieces of jewellery and the generation of multiples by casting and cutting-edge digital technology. Students are expected to acquire good workshop skills with the emphasis being placed on quality, accuracy and the professionalism as required by the jewellery industry. Thus the comprehensive knowledge required for a successful career is acquired and students are encouraged to produce commissioned work and interact with clients during their studies at the School. A diversity of materials is explored from brass, copper, silver, gold and platinum to plastics, wood and resins. Stone setting is introduced with a project based framework and developed into personal design skills and practical knowledge. 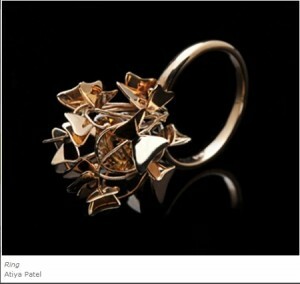 Students explore all jewellery media and learn to integrate traditional and non-traditional mediums in innovative and unique designs. Students are exposed to business management and marketing skills and successful graduates enter the growing South African Jewellery Industry with great success. Students also acquire all knowledge required to utilise the appropriate computer technology. The course is run by a dynamic team of lecturers who are specialists in their fields. All the lecturers are encouraged to be practising designers and jewellers so that they are aware of all the latest cutting edge trends. The Staff are committed to assisting students to realise their full individual potential. The School has a high quality educational structure within a friendly creative atmosphere. Classes are purposely kept small to facilitate individualised attention. Students are exposed to the industry with the opportunity to work shadow, engage in projects with real clients and freelance opportunities. Students are required to have successfully graduated from Grade 12 with a National Senior Certificate with a combination of recognised NSC (National Senior Certificate) subjects as well as certain levels of achievement in these subjects- at least 30% in the Language of Teaching and at least 40% in 4 recognised NSC 20 credit subjects. 2-Dimensional-1 Realistic Drawing of a kitchen utensil in pencil or ink on A3 (30 x 42 cm) cartridge. 2-Dimensional -1 Realistic Drawing on an accessory like sunglasses, handbag or shoes in pencil on A3 (30 x 42 cm) cartridge. 3-Dimensional - 1 Accessory that has been created in any media. 3-Dimensional - 1 Pendant from recycled/ alternative media. 3-Dimensional - Make your own world in a shoebox. The portfolio is advised to be well presented and mounted or in a Flipfile. 2. A 500 word Essay. 3. An Interview (if students are local). If an interview is not possible, greater emphasis is placed on the written motivation. 4. A Terminology List: (in your own words or from a dictionary) to be completed at the School after the Interview. 5. A 250 word written Letter of Motivation outlining student interests, strengths and reasons for the particular career path to be completed at the School after the Interview.